It’s not every day an athlete gets to train and be coached by a former Olympian. For University of South Dakota pole vaulters, they do get to experience this every day as they train with their coach Derek Miles. Miles is a three-time Olympic competitor who competed in Athens in 2004, Beijing in 2008 and London in 2012 in pole vaulting. Before his Olympic days, Miles could be found right here in Vermillion where he was a five time All-American in the pole vault for the USD track and field team. Now that he’s done competing in the Olympics, Miles has continued to support the track and field team as their full time pole vaulting coach. Miles graduated from USD in 1996 and got his Masters at USD in 1998. It wasn’t until he went to see a friend down in Arkansas in 1999 that his dreams of competing in the Olympics became a reality. When Miles went to Arkansas, he was introduced to Earl Bell, who was coaching the American record holding pole vaulters at time. Miles was able to receive advice from Bell and train with him once a month and said the progress he made was incredible. Miles was also the first alternate for the 2000 Olympics in Sydney, but said he wasn’t good enough to compete at the highest level until 2001. After 2001, Miles’ passion for the pole vault became a commitment and a profession for him. His dedication allowed him to qualify for three Olympic games and included a fourth place finish at the 2008 games in Beijing. Miles said 2009 is when he became fully dedicated to being a coach at USD. He had been a coach at USD off and on while training and competing, but wasn’t fully invested until the 2009 season. 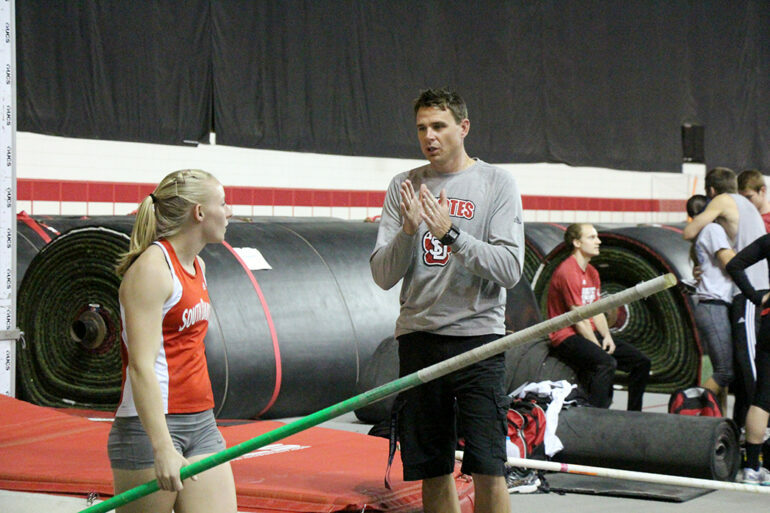 Since becoming a full-time coach at USD, Miles has helped transform the Coyote pole vaulting program into one of the top programs in the country. He has had coached many All-Americans, and during last year’s outdoor season had four USD athletes ranked in the top 25 in the nation. His athletes have nothing but praise for their coach. Maddie Aune, a first-year at USD, said knowing Miles was a three-time Olympian is almost shocking because of how humble he is. Fellow pole vaulter Madison Mills said the improvements she’s made in her three years with Miles are proof of his knowledge of the sport. Aune and Mills said Miles is an extremely laid back and humble guy. They said he knows how to make things work for each individual athlete. But perhaps their favorite quality about Miles is his passion for the sport. For Miles, he couldn’t ask for a better place to be in his career than where he is right now.